Standard Paint Colors (SPC), the most widely used paint color samples, is issued every 2 years. Over 30mil. decks are published since 1954. JPMA color codes starts with an alphabet, indicating the year it was published. Latest edition, 2015 "H" series is available now. Lead/chromate free paints are applied to all color chips. 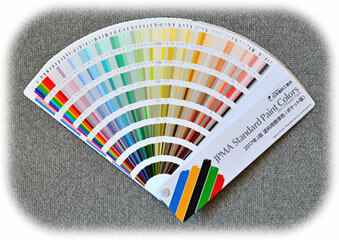 Simply order your color by JPMA color code, and the exact shade will be available. 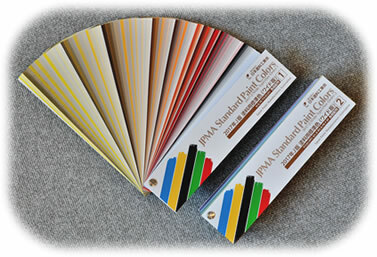 Colors specified by Japanese Industrial Standard (JIS), such as Safety Colors and Identification Colors are included. 16 New colors are added and 8 colors are deleted from 2015 H-edition. Contains Color Universal Design Recommended Color Pallet, that helps to design human-friendly colors, equally recognizable by people with various color perceptions. Pocket type and wide type are available. For users outside Japan, we have English version, with English information sheets. Price 2,862 Japanese Yen per set. Please fax (+81-3-3443-3599) or e-mail us () for conditions of orders. We'll send you invoice, payment via Paypal (oversea customers only). Shipment by EMS upon receipt of payment. Since T edition (1995), the color code is fixed except for the first alphabet. J15-90B in J edition (2017). Until 1993 (S series), the color code came in "X00 - 000(0)" (X stands for an alphabet, 0 for a number) style. First half of the code defined the edition code and the page number, and the actual color was defined by the 3 (or 4) digit number following "-".